BNP Paribas Wealth Management has issued the first edition of its new Global Entrepreneurialism Report which examines the behaviours of successful entrepreneurs and angel investors. Over 2,500 high net worth individuals (HNWI) and ultra-high net worth individuals (UHNWI) with a minimum current net worth (excluding primary residence) of USD 2 million and an average of USD 7.6 million. This significant sample, spanning 17 countries across four regions – Europe, Asia, the United States and the Middle East – replied to a survey conducted by Scorpio Partnership. 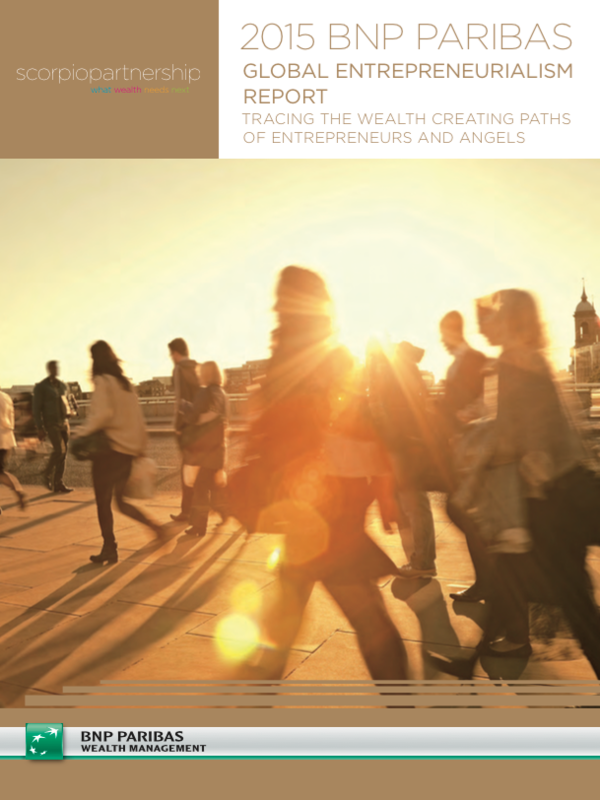 This year’s publication explores the wealth creation patterns of Angel Investors. He is a man having an average wealth of USD 7.6 million. He comes from an entrepreneurial family and runs at least 5 companies. He was 32 years old when he started his entrepreneurial journey. His businesses are in finance, retail and technology. He invests 9.4% of his total wealth in business angeling and expects 28% return. Average age when first considering becoming an entrepreneur is 30 years and one month old while the average start date is just under 32 years (average age of the sample is 43 years old). In the Middle East the thought process starts at just over 25 while in the United States it starts at almost 33 years old. 60% have a history of business ownership within their family. More than a 75% of entrepreneurs in Taiwan, Spain, Poland, the Gulf countries andTurkey have a family legacy in entrepreneurialism. European mature markets and the USA have a combined average of 56.3%. Preferred industries are financial services (16%), retail (15%), and technology (14%). 1,000 women represent 37% of the total sample. Women entrepreneurs typically launch about 5 businesses compared to 4.3 for theirmale counterparts. At USD 9.1 million the average turnover of primary business for women is highercompared to USD 8.4 million for men. Angel investors allocate on average 9.4% of their portfolio to angel investments with an average return target of 27.7%. Italy, Switzerland, and Turkey have a significant concentration of angel investors. They invest a higher proportion of their wealth in angel investments at respectively 12.8%, 11.0% and 10.6%. Entrepreneurs over the age of 50 have a return target of 18.4% compared with 30.1% return target for entrepreneurs under the age of 50. Perception of risk in the context of angel investing is very balanced. 49% consider angel investing as having relatively low risk. 77% of Turkish and 78% of German angels view angel investments to be low risk while China is markedly below with 33%. The future preferred regions for angel investments are dominated by home market regions, where the preference is typically to allocate 75% of available angel investments capital. The only exception is the Middle East where 62% of angel investments take place outside the home region. Part of BNP Paribas group, BNP Paribas Wealth Management is the world’s 5th largest private bank, present in some 30 countries across Europe, Asia, the USA and Middle East. Over 6,300 professionals, based in every major financial centre, provide a private investor clientele with solutions for optimising and managing their assets. The bank has €299 billion worth of assets under management (as at end September 2014). Understanding their specific needs at each step of wealth creation throughout thedevelopment of their company. Celebrating entrepreneurialism by putting into place long lasting partnerships (EYAwards, BFM Awards…) and an exclusive new report on entrepreneurialism.